Frank Broyles, the former University of Arkansas head football coach who led the team to a national championship in 1964, died Monday, Aug. 14, 2017, according to multiple news sources. For full obituary and coverage from Legacy.com, click here. We will all miss Frank. He was a blessing to the people of Arkansas in so many ways. Thanks Coach for the times you and Coach Royal gave us (college kids) those golf tips at Paradise Valley back in the 70's. God Bless You all. Dan,Tommy and family. Coach Bret & jennifer & briella bielema. Know he is with his lord and savior and calling the hogs in heaven. Coach will be missed, thoughts and prayers for his family. Go Hogs! Sending love and prayers to the family of Coach Broyles. Thanking God for giving us the opportunity to have Coach touch all our lives. I would like to offer my sincere condolences to the Broyles family. I know you are already aware of the impact he had on so many lives, mine included. I never remember Razorback football without Coach until his retirement. I was honored to have had several visits with him over the years. The one thing that always sticks with me is the fact that he always made me feel we were close friends and he had known me all my life. That is just the kind of gentleman he was. One of my favorite memories is his story telling. At each visit, I always got a great Coach Broyles story. There was no way you could be in his presence and not smile! I feel I am a better person for knowing him. As I enter my 4th quarter, I want to do my best to live my life as Coach did! Thank you for sharing him with the rest of us! May God continue to comfort you all. Fly High Coach Broyles! We will miss you tremendously. To a great Man.He will be missed. I will never forget Him he was like a father to me and help me so much. My deepest sorrow for the Broyles family. Thank you for the wonderful memories. Arkansas will miss you greatly. RIP Coach. Praying God will comfort each of you as only he can. 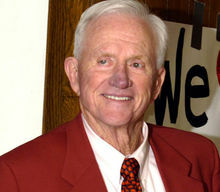 My condolences to the family of Coach Broyles. He was more than a coach, he was a true example of a leader. He will be greatly missed in this community. My prayers are with you and your family during this difficult time now and days ahead. I had Coach Broyles as a patient several years ago. I found him to be one of the most interesting patients I've ever head. I could have talked to him all day. His wife Gen was equally as nice . Arkansas lost its biggest fan this week. The impact he had on Arkansas as a whole cannot be measured. We were blessed to have him for our own. My sympathy to his family and all those he touched. There's no one like Frank Broyles. He was a father figure, friend and mentor to many. He had an infectious smile and always took time to listen. His enthusiastic spirit and love for the Razorbacks are forever with us. I first met Coach Broyles in the 1960s when I was a senior at Peabody University High, on the U of A campus. Before kickoff of one our Razorback football games in Fayetteville, Coach, in his Georgia accent, told us to call the Hogs loud enough so Little Rock could hear it! Coach Broyles had a stalwart Faith in The Lord. He fought the good fight, he finished the race, he kept the Faith. I know Coach is calling the Hogs in Heaven today! What a wonderful life and legend! Growing up in Fayetteville and at the U of A in the 60's, Frank Broyles was RAZORBACK FOOTBALL and even after moving from the state in '71, followed his career not only as the AD but his life spent continually helping others. Thank you family for sharing him and his life! A true gentleman fore every man to emulate! A sad day in Arkansas, but a joyous day in heaven.. You will be missed Coach.. Wooo Pig Sooooie!! I met coach at a FL-GA game in Jax, FL when he was commentating. I wanted to talk about his career at Georgia Tech, typically, he wanted to talk about how long I had been a fan of the Techs. God bless all associated. Rest in Peace Coach Broyles. You have earned it. Very saddened by the passing of Coach Broyles. I remember the first game and the last game he coached at Arkansas as if it were yesterday. A true Southern Gentleman and real ambassador for the State of Arkansas and Razorback football. He leaves a legacy that will probably never be surpassed in Razorback athletics . By far his greatest achievement as coach at Arkansas was not winning football games but developing character of the young men he coached. Our condolences to the Broyles family. Please accept condolences in your loss. May the God of Comfort strengthen you in your time of bereavement and help you in the weeks and months ahead as you deal with your loss. Thank you to Mr Broyles family for sharing him and his talent with us. May the God of comfort and peace be with all of you. God love you. I have used Coach Broyle's play book on helping a loved one (his first wife) with Alzheimer's and so many families have benefittef from it. So very sorry to hear he was also strickened with this horrible disease. Prayers to the family and thank you for sharing your parents with us! Thank you, Coach. Thank you. Rest in peace, assure you made your mark - and a great mark it is - and you will never be forgotten. The entire Sutton Family has been so Blessed by Coach Broyles and his whole family...He brought our family from Creighton University and introduced us to becoming Razorbacks... We loved every year we were there...I loved his hearty laughter and his eyes that lit up at the same time... His wife Barbara was always so gracious and was a true Angel on earth and yes, she welcomed him Home...We love all of your family Betsy, your family will always be part of ours..
Coach Broyles was associated with college football at a time when there was far less money involved and the importance of a college education was emphasized. He also became one of the best TV commentators ever for ABC. Thanks for the fond memories coach. Godspeed Frank, and thank you for sharing a part of your life with us. As a youngster growing up in HelenaI I idolized Coach Frank Broyles. Later in life I worked with and around him and the feeling never changed. He will be sorely missed. My thoughts and prayers go out to his wonderful family. My heart goes out to you and the family. Your dad was one fine gentleman. I will always have memories from 9th grade and the fun everyone always had with your family. He and Mrs. Barbara are in their home with our Lord and in perfect health once again. My prayers for all of you. RIP Coach Broyles. You will always be the first name that is Arkansas Razorback football A legend!! Coach Broyles was a very understanding and carrying leader of men. He made athletics what it is today at Arkansas. My thoughts and condolences are with the Broyles' family at this time of loss. He was a very fine gentleman in addition to his many career accomplishments. My love to his family. God bless. What a long and full life! So many cannot say the same. May Frank Broyles forever be in our hearts and in God's book of life. My wife ànd I were sorry to heàr of the passing of Coach Broyles. We will always be mindful of the things he did for Arkansas and the U of A. Our thoughts and prayers our with the family. Broyles was a great coach and put Arkansas on the map. My prayers are with the family. No words can express the sorrow felt by family, friends, and fans. Coach Broyles was difinalely the best man, coach, director, and role model. His legacy is the positive effect he had on so many lives. He lives on through those he touched. My prayers for comfort and peace through this time are with the family, as well as all of us that felt the impact of his life. I am so sorry for your loss, may your memories keep consoling you and may God sustain you with his promise of one day soon reuniting you with your loved one. Some words of comfort In Hosea 13:14. My deepest and sincere condolences to your families and friends. I hope he wonderful memories of your dad help you during this sad and difficult time. Our dearest condolences go out to the Broyles family. As the days and months pass, may you draw ever closer to our Almighty Father to carry and strengthen you in your grief (James 5:8). The Greatest of all times!! He will always be Mr. Razorback.My prayers are with all of you. There will never be anyone to love the Razorbacks like he did. I lived in Arkansas all of my life and still call the Hogs on TV.I will never forget Frank. I am so sorry for your significant loss. May the God of all comfort bring you peace during this time of grief and sorrow. I was a skinny Sophomore End at Missouri when Coach Broyles arrived 60 years ago to lead the Tigers. He was an exceptional coach, father, husband and role model for so many young coaches and administrators. Easily one of the most influential men in my lifetime. The university and the state just lost their greatest Razorback! A well lived gives credit to our Creator who made us in his image Genesis 1:27. It is no small wonder that we thirst for life to realize our dreams and to search for new adventures. One day soon, our Creator will provide an environment in which we no longer cry from the pain of death. My sincere hope for you and your family. Offering condolences for the loss of your loved one. May your fondest memories, loving support of family and friends, and the wonderful provision God made by means of His loving kindness (John 3:16) help to strengthen and console your hearts during difficult times.